Like many Americans (I'm assuming here), I haven't read too many first-hand accounts of Hurricane Katrina. I remember watching it on TV, seeing this city that I loved turn into an absolute state of chaos. Seeing the conference center I'd spent more than a week in turn into a den of human suffering. And beyond that, I knew that it had been mishandled by the government on all levels -- city, state, national -- and also by the people that had refused to leave. This new book by Dave Eggers (one of my favorite authors) shed a whole new light on it for me. The back cover describes the tragedy as both natural and having something to do with terrorism. This confused me a bit...terrorism and Katrina? I hadn't heard that one before and was wondering how he'd weave it in. Zeitoun is an American, born in the middle east. He and his family had a booming business in New Orleans, and he is as hard a worker as you've ever seen (in a way, his description reminded me of my dad, who I think would also have been bull-headed and not left his business in the path of an oncoming storm). His family leaves NOLA, while he stays behind. 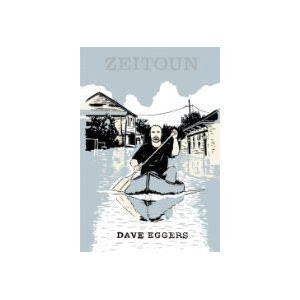 While not wanting to spoil it, Zeitoun's story really shed light on the human element of Katrina, and the scary idea of martial law. Zeitoun and his friends were able to help many people that government officials would not, and then were suddenly suspected as terrorists due to the color of their skin, despite having official documentation. This was part of Katrina I didn't know...that it had gotten so out of control that even those who helped were treated like prisoners at Gitmo. The writing is a little uneven, but it's a quick, important read. Katrina is one of the biggest national failures of recent history, one that I sincerely hope will not be repeated.